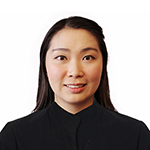 Cathy Huynh graduated with Bachelor of Oral Health Sciences at La Trobe University in 2011 and has been caring for patients in both general and orthodontic practices ever since. Cathy was trained by the University of Melbourne’s orthodontic lecturers at her first practice out of university, setting her up with a very strong orthodontic background. Cathy loves caring for patients for their regular dental cleans and particularly enjoys working with our specialist periodontists to treat mild to moderate gum disease. She also supports our specialist orthodontists with fixed braces and Invisalign cases and is trained to perform Zoom! professional teeth whitening. Cathy takes pride in performing thorough, gentle and caring dentistry on all of her patients. She understands that most patients can be quite nervous and anxious about being at the dentist, which is why she's passionate about helping to ease her patients into treatment here at Smile Solutions, so they have a better chance of looking forward to their next visit. Cathy has volunteered to provide dental education to kindergarten and preschool children at the Anderson Road Childcare Center at her previous private practice. She is also a member of the Dental Hygienists Association of Australia and is constantly building on her dental knowledge to ensure she knows the best ways to help treat and educate her patients. Outside of work, she enjoys travelling, playing racquet sports and volunteering for charity work in the community.